Found in areas of volcanic activity. Obsidian is natural glass, and is the result of lava that cooled quickly. Black and opaque, with the appearance of whitish "snowflakes". Snowflake obsidian contains internal inclusions (crystallites) which produce the snowflake appearance. This interesting form of obsidian is found in Utah and Wyoming. Snowflake obsidian is not enhanced. Snowflake Obsidian is a member of the Apache Tears gemstone family. With white snowflakes. Stone may vary somewhat from what is pictured. With gray snowflake like areas. 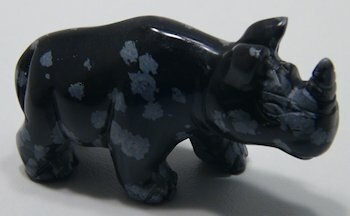 A Black obsidian, with areas of gray. Good cut, good polish.